Rocker Marilyn Manson will be exhibiting his watercolor paintings at Space 39 Gallery in Fort Myers, Florida, April 1 through April 17, 2007. A private reception for collectors will be held March 31. On Halloween night, 2006 Marilyn Manson opened his own gallery in Hollywood called The Celebritarian Corporation Gallery of Fine Art. 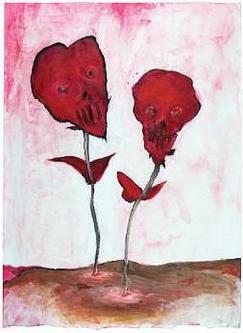 The image posted here is "Les Fleurs du Mal" by Marilyn Manson. Edit June 29, 2007: Marilyn Manson Exhibit opens in Cologne, Germany.